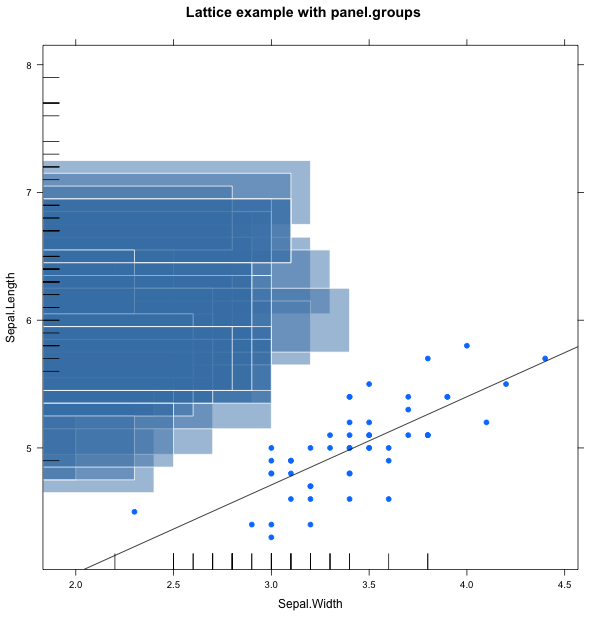 Last Tuesday I attended the LondonR user group meeting, where Rich and Andy from Mango argued about the better package for multivariate graphics with R: lattice vs. ggplot2. As part of their talk they had a little competition in visualising London Underground performance data, see their slides. Both made heavy use of the respective panelling / faceting capabilities. Additionally Rich used the panel.groups argument of xyplot to fine control the content of each panel. Brilliant! I had never used this argument before. So, here is a silly example with the iris data set to remind myself of panel.groups in the future.